I love fresh whipped cream, I’m not a big fan of store made dessert whipped toppings. BUT some recipes call for that stabilized whipped topping, so why not make my own? It tastes better AND it’s really easy! You really are just adding gelatin to the whipped cream your making. There are a few tips and trips, like when to add it, but pretty much that’s it! This way it’s stronger, you can use it in recipes, or pipe it even, like onto a pie or cake without it getting all melty! So you need whipping cream, vanilla and sugar, just like normal, and some gelatin and some water to dissolve it into! Easy peasy, I always have these around! Sprinkle the gelatin over the cold water and let it bloom for 5 mins. While that's resting add the sugar and vanilla to the whipping cream (feel free to do more or less to your tastes). Once the gelatin has bloomed microwave it until it's dissolved. Then, while whipping the cream, slowly add the gelatin to the cream. Beat in a mixer with a whisk until soft or stiff peaks form (your preference) and keep refrigerated! Do you love fresh whipped cream like me? or are you a whipped topping fan? No judgement, some people LOVE it, I grew up on it. It’s so simple! 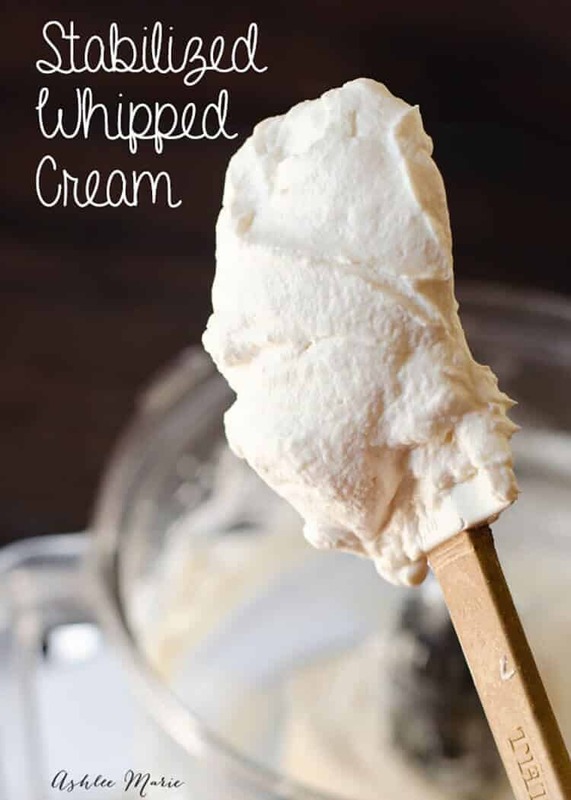 I always make whipped cream at from scratch. I think it makes all the difference in the world! This is a great idea! Thank you! Do you think it would be okay to add food coloring to it and use it as a cake frosting? Thanks! The best idea I’ve seen in a long time. Great idea! 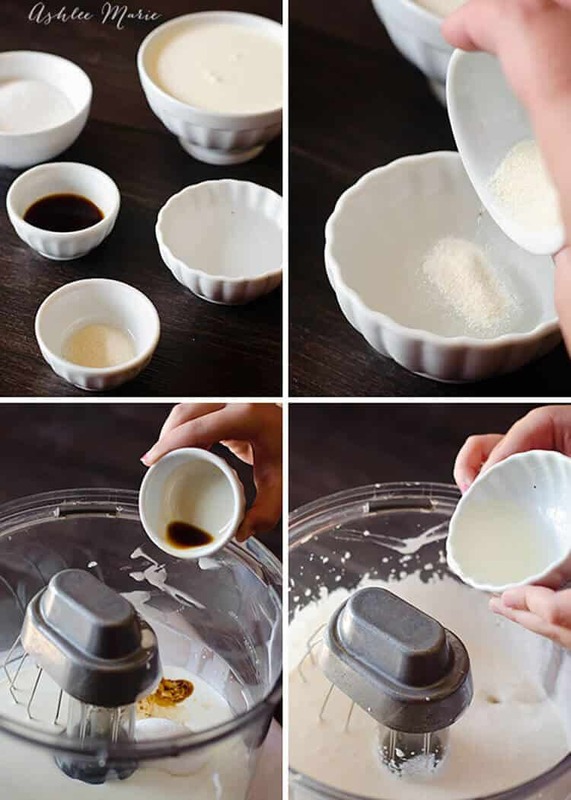 I’m going to make this paleoish and use coconut cream and coconut sugar syrup..I’m not sure if gelatin is Paleo but I’m strict enough about it to avoid gelatin. Looking forward to using this for the approaching holiday and party season! let me know if it even works with coconut cream! I’m going to add this on to my cheesecake! it’s great for any dessert that needs to sit out at all! you are so welcome! just be careful not to overwhip and you’ll be super happy with it! What kind of mixer is that you have there? I am making strawberry shortcake cupcakes, would this whipped cream hold its shape if i put a strawberry drizzle/ glaze on it? I am wondering if the warmed up water with the gelatin would create a problem for whipping the cream. About how long do you microwave it? I am wondering the same thing. I just made it- and it seems really liquidy? it’s never been an issue for me, as long as the whipped cream is already whipped to soft peaks and your just pour it in a thin stream it isn’t a problem. but you only microwave for like 45 seconds and then you can let it cool for a min if you want, but I usually just turn on the mixer and stream it in and it cools as it whips pretty quickly. about 30 -45 seconds is all it took. and since your pouring it in a thin stream while whipping it it doesn’t really effect it. and it whips up so quickly you really want to watch so it doesn’t over whip. I’m having a wedding in October and I’m making my own mini pies for the dessert bar every pie goes great with whipped cream. How long till the whipped cream melts? How long would they be able to stay out ? Please and thank you and ps. Huge fan. cakes and love. Hi Ashlee, I wonder if this recipe works in a hot weather or in a humid weather, do you revoked to used a little more of gelatin. I have used your recipe 3 times now and all times were a tasteful success,3 different recipes same recipe. Thank you for posting this. I live in Houston Tx and I had to find one that held up to the humidity and heat and yours was the best.Thank you so very much. ?Leah Ps : I loved watching you on FoodNetwork. yay! I seriously make a batch or two a week! Hi and happy New year I’m from Trinidad and Tobago and wanted to find out if this recipe would frost a two layer cake? I am making mini pumpkin pies in 4 ounce jars for a baby shower. 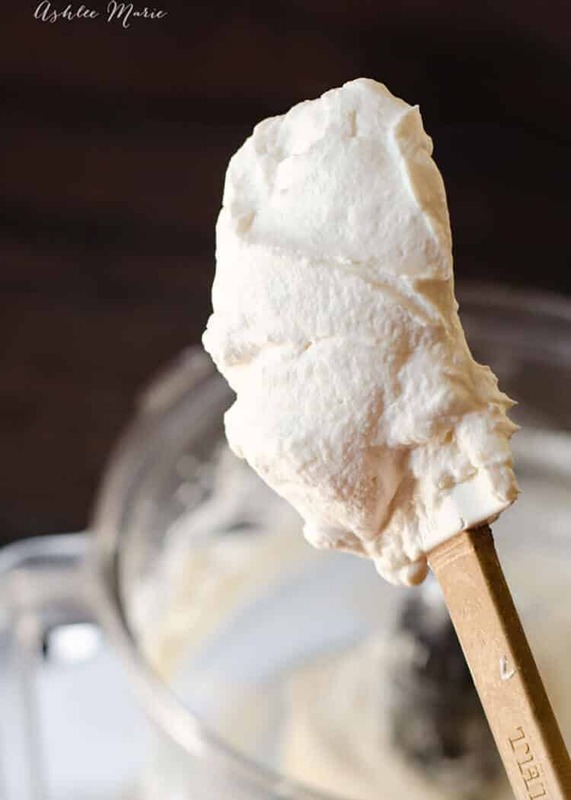 Could I whip this cream ahead and decorate the cooled pies the day before the shower without fearing I’d wake up just hours before the luncheon to find the whipped cream in puddles?